In 1985, The National PTA established Teacher Appreciation Day as the first Tuesday of the first full week in May. This year, Teacher Appreciation Day is celebrated in the US on Tuesday, May 7, 2019. While the observance is sometimes known as Teacher's Day or National Teacher Day, the sentiment remains the same as students and parents recognize teachers for all their hard work and dedication. With all that is required of teachers - and how young lives are touched in such a tremendous way - it is amazing that there isn't a special Hall of Fame for teachers. Until then, why not show your favorite teacher how much you appreciate them? Take it from teachers -- anything that comes from a student's heart, even just a spoken "thank you", will mean the world to them. For a quick and easy idea, fill a mason jar with Peppermint Patty miniatures with a gift tag reading - "To the COOLEST teacher around!". Or, fill a large mug with caramel popcorn with the message "Here's to the school's most 'pop'-ular teacher!" In the kitchen, check out your recipe file for your favorite cookie recipe. Bake up a batch and present them in colorful plastic wrap with the message "Thank you for making me a smart cookie!" You can also do the same with a homemade bundt cake with the message "For a great teacher - Thanks a bundt'ch!" If you're crafty, make colorful DIY paper flowers and attach them to the top of green No. 2 pencils. Place your homemade bouquet in a mug, with a gift tag reading: "Thanks for making me bloom!!" Or, get the kids involved by putting their hand-prints on card stock with the message: "Hands down, you're the best teacher around!" Make it all even easier by checking out free teacher appreciation day printables including gift tags, DIY greeting cards and craft projects. And, if you're still stumped, try 101 DIY Teacher Appreciation gift ideas. The best homemade gift of all? Sit yourself down and write a heartfelt 'thank you' to the school principal on behalf of a deserving teacher. Describe all the positive ways in which they have influenced your child's development during the school year. Your child's teacher will always remember your thoughtfulness. Besides flowers and cards, popular gift ideas or teachers may include a gift certificate, gourmet gift basket, a "Best Teacher" trophy or coffee mug, or a book of inspirational poems or quotes. For a group gift, parents might organize to share the cost of a new leather brief case, a voucher for a weekend getaway, a customized plaque, or another special gift that a teacher might especially appreciate. • In the 1940's, it was teacher Mattye Whyte Woodridge who first promoted a day set aside to celebrate teachers. Although it took many years, Woodridge finally saw her idea become reality before her death in 1999 when Congress finally declared National Teacher Day in 1980. Madeleine Albright, Laura Bush & Bill Clinton. 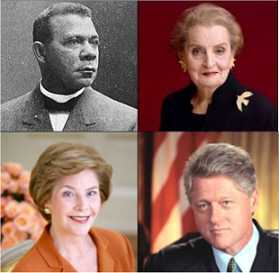 • A long list of famous American teachers include African-American educator Booker T. Washington, President Lyndon Johnson, President Bill Clinton, TV personality Joy Behar, First Lady Laura Bush, and diplomat Madeleine Albright. • Year after year, polls have shown that teachers remain among the top five most trusted professions in the US for honesty and integrity. Other professions that traditionally make the list include nurses, military officers, medical doctors, and pharmacists. • A teacher’s contract day does not include time spent working at home. And that may including anything from one hour in the evening preparing lesson plans -- to 16 hours on the weekend grading tests and homework. • Still a melting pot, America holds the top spot of having the most international students in the world. • Many other countries have similar celebrations. September 5 is the day set aside in India to recognize the special contributions made by teachers, while in China the day is celebrated on September 10. Throughout Latin America, September 11 is Teacher's Day. 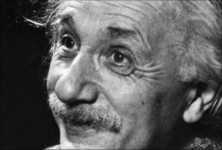 Meanwhile, World Teacher Day is recognized by UNESCO each October 5.
the only way to teach." - Albert Einstein. National Teacher Day - Download a poster to help celebrate this special day in the U.S., and learn that even celebrities have a favorite teacher. See a vast listing here, along with a brief history of this holiday, and check out the the rest of the site dedicated to educating today's children and what it takes to be a teacher. Teacher Appreciation - Browse this site for all kinds of useful information on how to honor a teacher this year. Teacher Appreciation Quotations - Discover poems, quotes and sayings in honor of the day. Care2: Teacher Day E cards - Find cute, clever and animated e-cards to send to your favorite teacher.